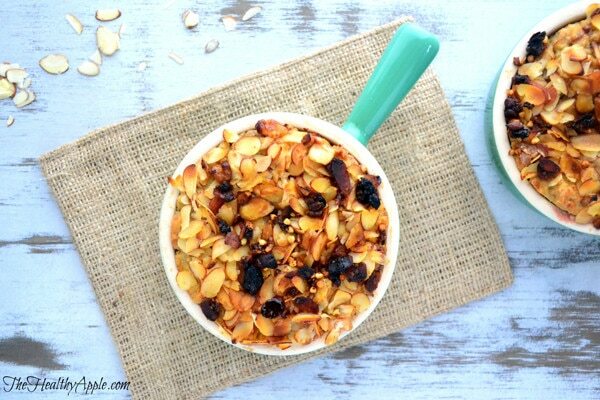 Who doesn’t love warm healthy breakfast recipes in the middle of winter? I know that I’m a fan of gluten-free breakfast ideas that are filling and fill up my belly during these chilly months. I’m sure you don’t have any more leftover holiday pie or chocolate cake in your fridge, right? Because if you did- that’d be a little scary. and moldy. and kinda sorta gross. Those holiday sweets are long gone and I’m excited to bring you a hearty naturally sweet breakfast (or dessert) that you can serve when you’re yearning for that Valentine’s candy next week or those holiday sugar cookies that are no longer in your cookie jar. There’s something special about baking oatmeal. I mean, you can whip up instant oats in the microwave in a jiffy but they’re pretty gross and taste like saw dust- plus I don’t promote microwave usage nor do I promote instant oats. 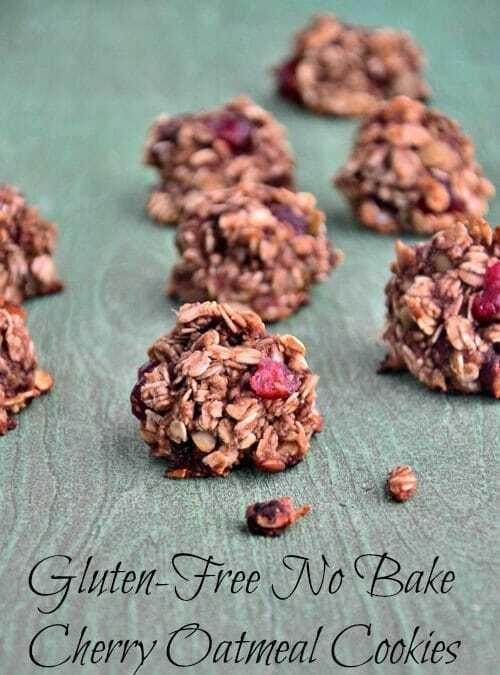 Rolled gluten-free oats and I bake ’em! 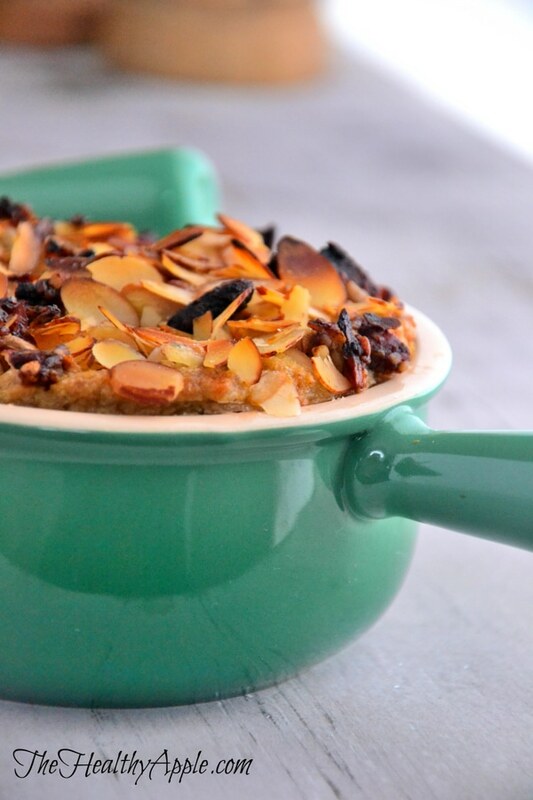 And if you’ve never baked your oats…well then you’ve gotta lotta goodness coming your way right now. Since you probably stuffed yourself from the past few weeks during the holidays, this is a yummy way to get back on track and start your day off on the right food. You’ll be satisfied and not hungry after 30 minutes like so many blah boxed cereals will do to ya. Have a little fun. Put a little sunshine in your gray, freezing January day and bake yourself this bowl of yumminess for breakfast tomorrow. Add your own fun toppings. Whatever you want! I suggest almonds, dried blueberries, hemp seeds, flax seeds and chia seeds. I also LOVE adding almond butter to make this extra creamy inside…(that’s my secret). 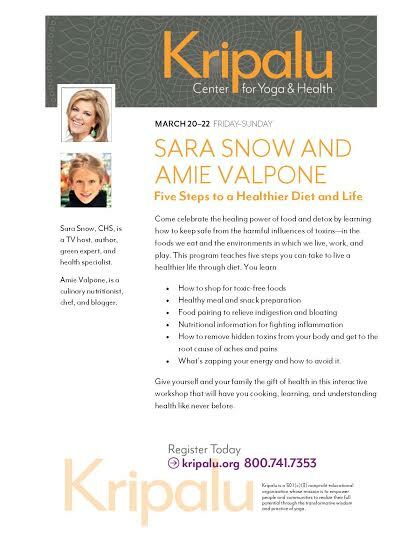 And if you missed my message from a few weeks ago, I want to personally invite all of you to my 3 Day Workshop at Kripalu “5 Steps to a Healthier Diet & Life” that I’ll be hosting with my amazing friend, Sara Snow. 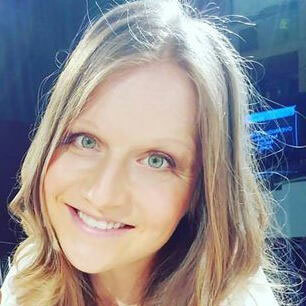 The workshop will take place Friday evening, Saturday and Sunday March 20-22. More info is below. I’d love to see you there. Space is limited, so if you are interested you can Register HERE and here is more info about our workshop on the Kripalu website. Preheat oven to 375 degrees F. Prepare and grease an 8 x 11 baking dish or 6 (2 cup) ramekins with coconut oil. Set aside. In a large bowl, combine oats, baking powder and sea salt. In a separate bowl, combine almond milk, syrup and extract; add to dry ingredients; mix well. Add cinnamon and mix again. Transfer mixture to prepared ramekins. 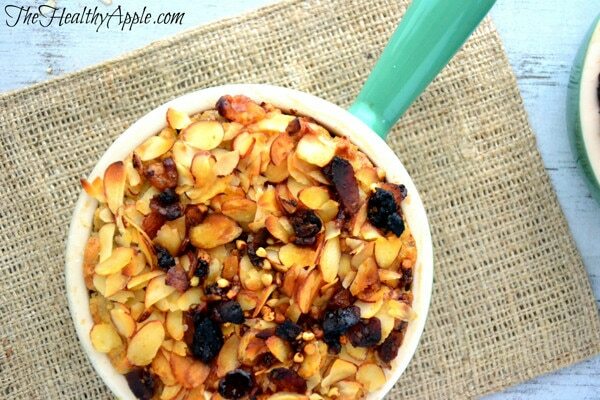 Sprinkle with slivered almonds and blueberries. Remove from oven; sprinkle with flax seeds and drizzle with almond butter. Return to the oven for 2 more minutes. Remove from oven; set aside to cool for at least 20 minutes before serving. Can’t wait to try this one! Once again, you have outdone yourself with creative, fun ideas & interesting alternatives for those of us with multiple allergies & sensitivities. Pinned! Must make for next brunch. This will be Tomorrow’s breakfast. Thanks. It looks delicious. My son is allergic to oatmeal, but this looks so delicious. Thoughts on a substitute for the main ingredient? Can this be made ahead of time? Say a week before then reheated in the oven? 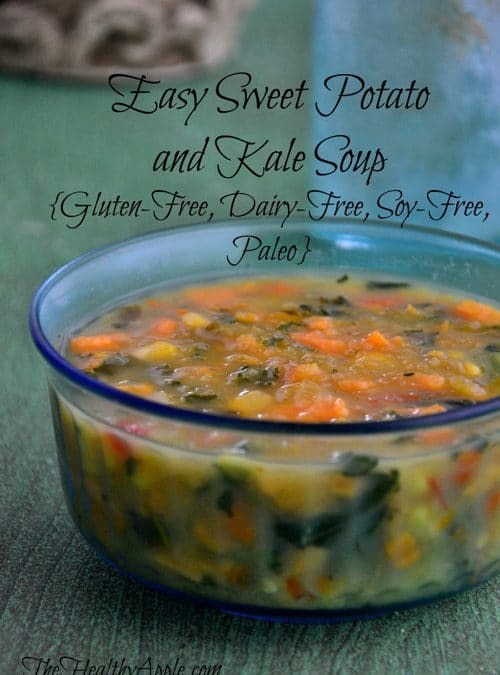 Made this recipe today and it was pretty good. I changed a few things. Since I only had steel cut oats, I used them instead of rolled and since they were cut I knew they would probably soak up more of the milk so I used 3 cups of milk instead of 2 1/4 and I used 2% since I have no issues with lactose intolerance. The consistency was like a moist brownie. I baked it for the same amount of time the recipe calls for. I used honey instead of syrup for anyone who may want to know. I do think it could have been a bit more sweet so I may add a little more honey or maybe even some aguave next time. Thanks for a good gluten free alternative for breakfast. This kept me going for hours after I ate it! I can’t wait to try this. 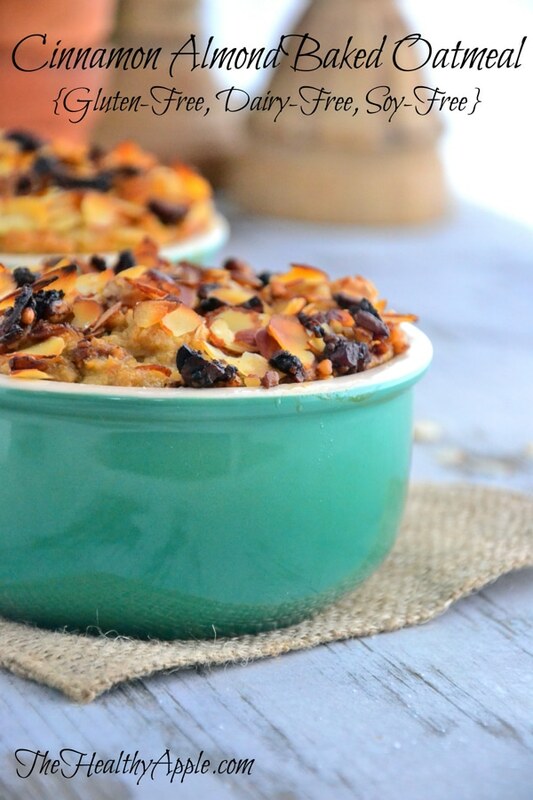 Finally a baked oatmeal recipe that doesn’t have eggs in it.